As the holiday looms even nearer, I have more new makeup launches to share with you and I do like these quite a bit. 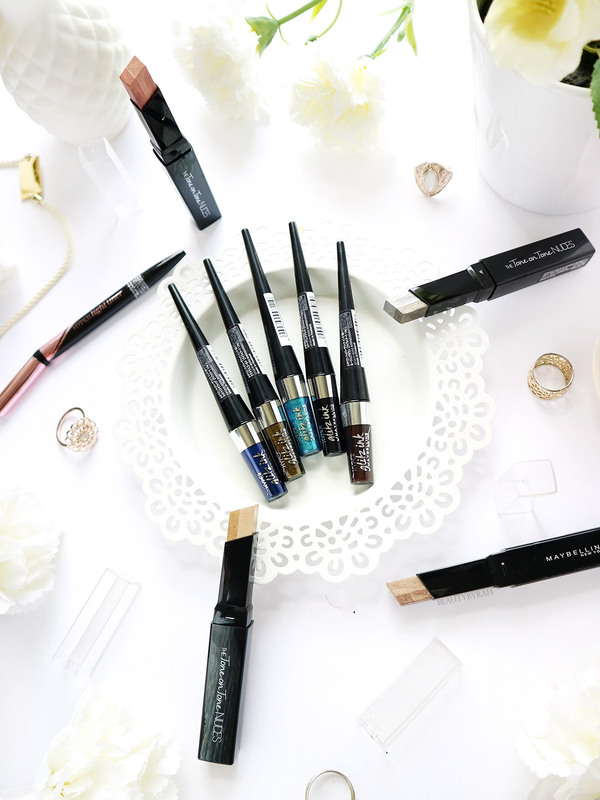 Recently, I attended a preview of Maybelline’s Holiday Collection which consists of the new Hyper Glitz Ink Liquid Liner , Tone On Tone Nudes Dual Eyeshadow Stick and Hyper Tight Liner. I am definitely a fan of the Hyper Glitz Ink Liquid Liner and I can't wait for the occasion to wear these. 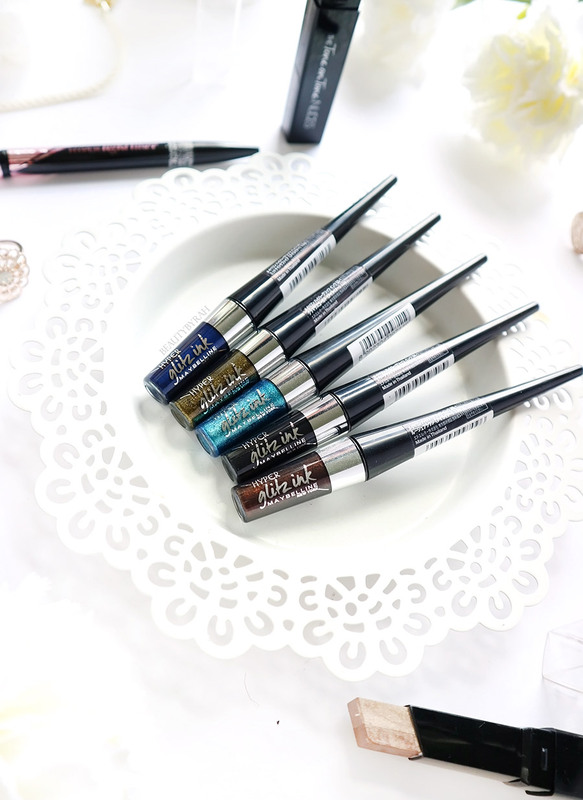 Having pigmented and bold shades in Liquid Liner form are truly rare at the drugstore and to see Maybelline coming out with 5 new shades (Cosmic Black, Moon Navy, Aurora Green, Stardust Gold and Galactic Brown) I was really excited. These liners are do have a felt tip applicator and they are nicely pigmented such that one stroke gives the colour of that in tube (except for the brown one which requires about 2 strokes for full opacity). If you want to build up the intensity even more, I found out that waiting for the first layer on liner applied to dry before applying a second coat helps quite a bit. If not, I found myself shifting the glitter and pigment, creating patches. The shades are so gorgeous and are perfect for the festivity and holidays! My favourite has to be Aurora Green. This electric turquoise blue is absolutely stunning and it really does add some fun definition to the eyes. I know going all out with glittery and bold eyeshadows on the lids may not be everyone’s cup of tea, so a glitter liner should do the trick nicely to up the ante on your holiday makeup. These are going for SGD 18.90 each. 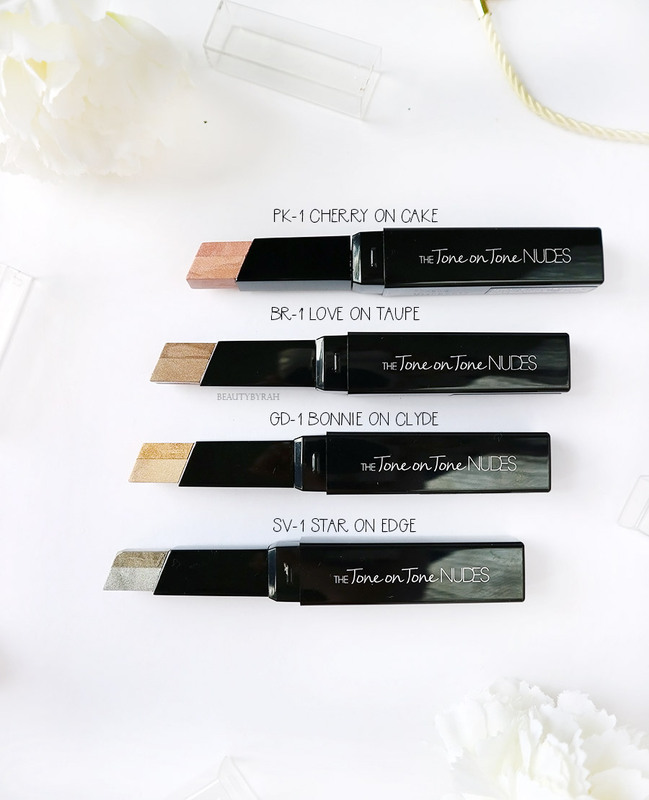 Maybelline is also releasing 4 new shades (Star on Edge, Love on Taupe, Bonnie on Clyde and Cherry on Cake) of Tone on Tone Nudes Dual Eyeshadow Sticks which are said to provide two complementary and creamy hues in one to add definition to the eyes in just one swipe. 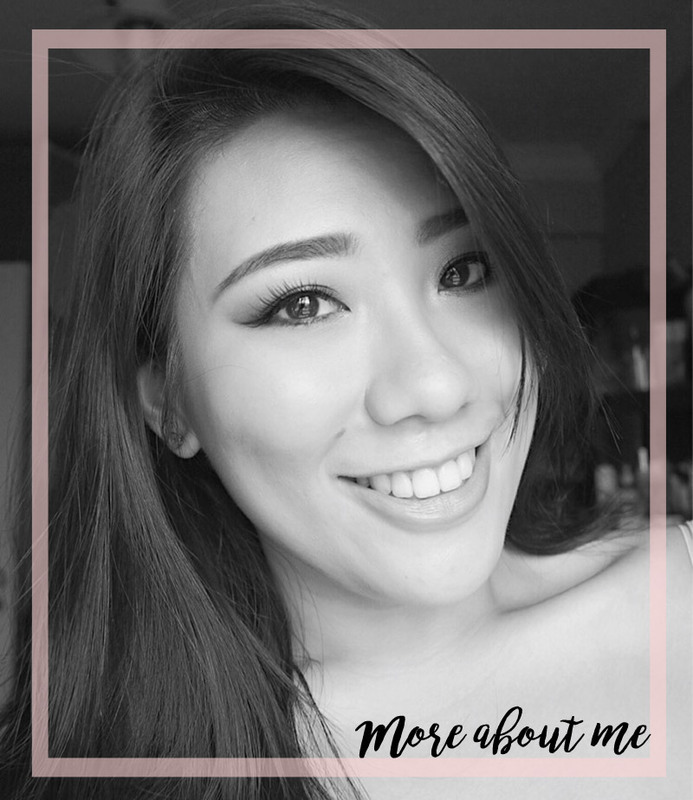 It has a pretty creamy formulation and it does glide onto the eyelids easily without much tugging. It comes with 2 shades, a dark and a light. I rarely wear eyeshadows sticks on their own, but these can work as a base for other powder shades as well. Maybelline recommends using the darker shade along the lash line and the lighter shade above on the mobile eyelid. This techniques works well to add definition to them monolids in my opinion. This is a definite quick fuss-free option! These go for SGD 18.90 each. 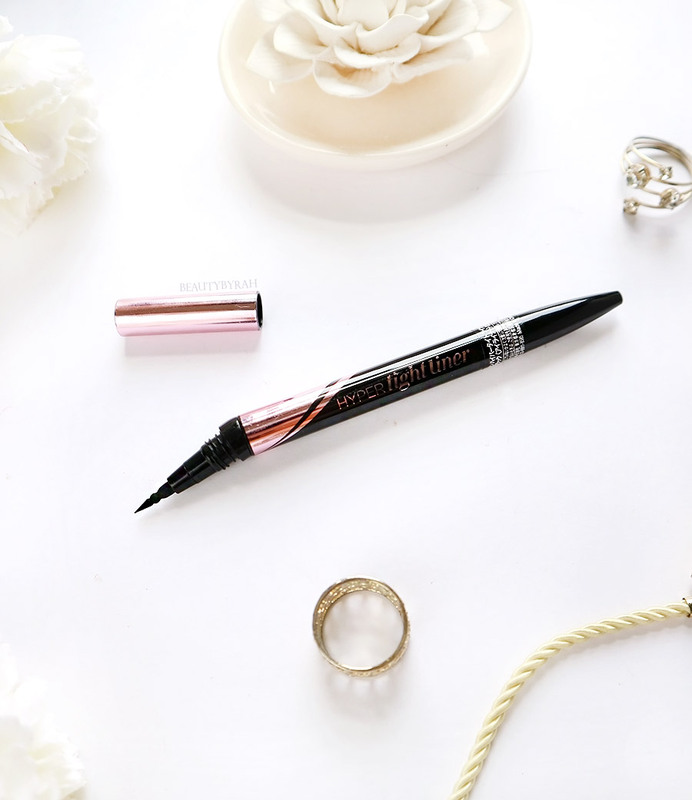 Another additional to the new launches is Maybelline's Hyper Tight Liner which is liquid liner that comes with a 15 degree angled pen brush. This is said to enable application to all corners of the eye to achieve a fuller lash line due to its ergonomic design. I always enjoyed Maybelline liquid liners as they are truly black and they do not smudge on me. This goes for SGD 20.90. Another 6 more weeks to Christmas. I can't wait! Hope the swatches were useful for you. I really recommend picking up one of the Hyper Glitz Ink Liquid Liners as these work so well for the price and are perfect for spicing the eyes up. I also might have a giveaway soon! Keep your eyes peeled here as I will update this post when I do and on my Instagram when it does go live. Did any of these new makeup launches catch your eye? How do you like to do your holiday makeup? **These products were gifted by Maybelline during the preview. Only honest thoughts are shared here, with no influence from others. I am not compensated nor affiliated to the brand.